The municipal council of my home town has the development plan before some years changed that no antenna-installations can now be erected more. A supposedly electro-smog-sensitive municipal council-member has induced the alteration. Before this had collected signatures with the reason in the residential area, in which my house stands, by my radio-business, I would cause insomnias. 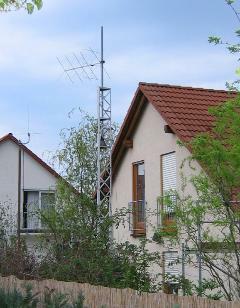 A ten meters high aerial-tower doesn't fit into the residential area. The municipal council-member, that lives in immediate neighborhood, has undertaken everything possible since then to away-receive the aerials. So, she complained before the Administrative Court in Wuerzburg - fruitless. The judges attested her a "far dispersed electro-smog-hysteria" in the judgment. You can read the judgment in the Internet in German language under http://web.archive.org/web/20080802180027/http://www.funkurteile.de/ (Urteile - Antennen - Funkantennen). For translating, you can use the corresponding function of Google with demand. Even if the arbitrary behavior of the municipal council judicial "benediction" has experienced, I will still proceed against it. If you want, you can help me: Write to the community Dittelbrunn or to the Landratsamt Schweinfurt, what you think of the affair - also in English language. Remain factual, but resolute. The recipients must recognize: Amateur-radio is a hobby practiced world-wide. Thank you for the contribution to the Ham-Sprit. The aerial-prohibition is no advertisement for a liberal country like Germany. The picture shows my "dangerous" aerials. The mast is six meters - approximately 20 ft - high.